Scientists at the Department of Energy's SLAC National Accelerator Laboratory and Stanford University have made the first direct measurements, and by far the most precise ones, of how electrons move in sync with atomic vibrations rippling through an exotic material, as if they were dancing to the same beat. The vibrations are called phonons, and the electron-phonon coupling the researchers measured was 10 times stronger than theory had predicted—making it strong enough to potentially play a role in unconventional superconductivity, which allows materials to conduct electricity with no loss at unexpectedly high temperatures. What's more, the approach they developed gives scientists a completely new and direct way to study a wide range of "emergent" materials whose surprising properties emerge from the collective behavior of fundamental particles, such as electrons. The new approach investigates these materials through experiments alone, rather than relying on assumptions based on theory. The experiments were carried out with SLAC's Linac Coherent Light Source (LCLS) X-ray free-electron laser and with a technique called angle-resolved photoemission spectroscopy (ARPES) on the Stanford campus. The researchers described the study today in Science. "I believe this result will have several impacts," said Giulia Galli, a professor at the University of Chicago's Institute for Molecular Engineering and senior scientist at the DOE's Argonne National Laboratory who was not involved in the study. "Of course they have applied the method to a very important material, one that everyone has been trying to figure out and understand, and this is great," she said. "But the fact that they show they are able to measure the electron-phonon interaction, which is so important in so many materials and physical processes—this, I believe, is a breakthrough that will pave the way to many other experiments on many other materials." "These precision measurements will give us deep insights into how these materials behave," said Zhi-Xun Shen, a professor at SLAC and Stanford and investigator with the Stanford Institute for Materials and Energy Sciences (SIMES) who led the study. 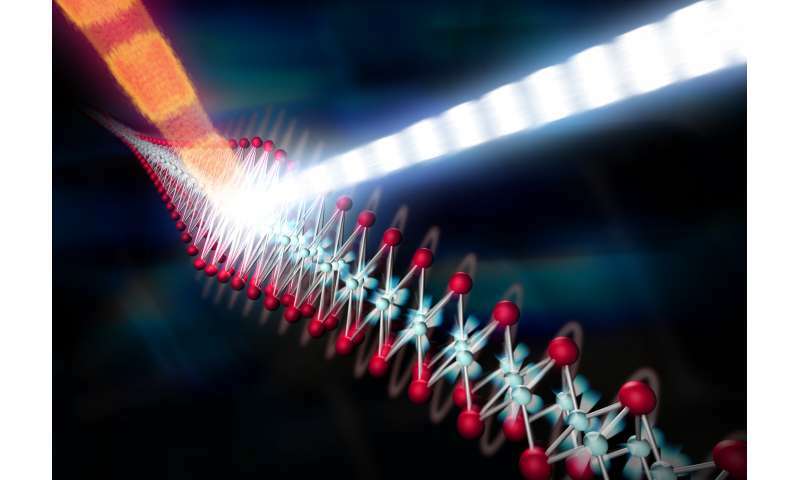 The team used SLAC's LCLS to measure atomic vibrations and ARPES to measure the energy and momentum of electrons in a material called iron selenide. Combining the two techniques allowed them to observe electron-phonon coupling with extraordinary precision, on a timescale of femtoseconds—millionths of a billionth of a second - and within roughly a billionth of the width of a human hair. "We were able to make a 'movie,' using the equivalent of two cameras to record the atomic vibrations and electron movements, and show that they wiggle at the same time, like two standing waves superimposed on each other," said co-author Shuolong Yang, a postdoctoral researcher at Cornell University. "It isn't a movie in the ordinary sense of images you can watch on a screen," he said. "But it does capture the phonon and electron movements in frames shot 100 trillion times per second, and we can string about 100 of them together just like movie frames to get a full picture of how they are linked." The iron selenide they studied is a curious material. It's known to conduct electricity without loss, but only at extremely cold temperatures, and in a way that could not be entirely explained by established theories; that's why it's called an unconventional superconductor. But five years ago, a research group in China reported an intriguing observation: When an atomically thin layer of iron selenide is put on top of another material called STO—named for its primary ingredients strontium, titanium and oxygen—its maximum superconducting temperature jumps from 8 degrees to 60 degrees above absolute zero, or minus 213 degrees Celsius. Although that's still really cold, it's a much higher temperature than scientists expected, and it falls within the operating range of so-called "high-temperature superconductors," whose discovery in 1986 set off a frenzy of research because of the revolutionary impact these perfectly efficient electrical transmitters could have on society. Following up on this clue, Shen's group examined the same combination of materials with ARPES. In a 2014 paper in Nature, they concluded that atomic vibrations in the STO travel up into the iron selenide and give electrons the additional energy they need to pair up and carry electricity with zero loss at higher temperatures than they would on their own. But could this coupling of atomic vibrations and collaborative electron behavior also take place in iron selenide alone, without a boost from a substrate? That's what the current study aimed to find out. Shen's team made a thicker, atomically uniform iron selenide film and hit it with infrared laser light to excite its 5-trillion-times-a-second atomic vibrations—like gently tapping a bell with a little hammer, SLAC staff scientist and co-author Patrick Kirchmann said. This got the vibrations oscillating in sync with each other throughout the film, so they could be more easily observed. The team then measured the material's atomic vibrations and electron behavior in two separate experiments. Yang, who was a Stanford graduate student at the time, led the ARPES measurement. Simon Gerber, a postdoctoral researcher in Shen's group, led the LCLS measurements at SLAC; he has since joined the SwissFEL at the Paul Scherrer Institute in Switzerland as a staff scientist. The new study doesn't prove that the coupling of atomic and electronic vibrations was responsible for boosting iron selenide's superconducting temperature in the previous studies, Kirchmann said. But the combination of X-ray laser and ARPES observations should provide new and more sophisticated insights on the physics of material systems where several factors are at play at the same time, and hopefully move the field forward faster. "The new approach investigates these materials through experiments alone, rather than relying on assumptions based on theory." Nucleus of atoms expanding and recycling expanding pushing force which have a nature of expanding dark lightwaves, expanding photons and nature of expanding electrons etc. This is going to turn out to be a pretty big deal. With images like this, completely gained from experiment, we can inform our models of phonon excitations to an unparalleled degree, and from this we can derive parameters that will let us make designer molecular structures that will enable really cool technical changes. This is one of those sorts of things that make it clear exactly what Arthur Clarke had in mind when he formulated his famous Third Law: The products and effects of a sufficiently advanced technology are indistinguishable from magic. If you doubt him, look in your kitchen at the magic box that stays cold inside. We'll crack room temperature superconductivity before long. And we'll do it using experiments like this one. This article confirms many posts I have made on Physorg, dating back to 2010, proposing that coupled periodic oscillations underlie all forms of superconductivity. In most or perhaps all such posts I have cited Art Winfree's general theory of coupled periodic oscillators, which he applied to biological systems--but not physics. Google the phrase Macksb superconductivity Winfree. You will find numerous posts in which I describe Winfree's theory and apply it to physics, including perhaps forty or more Physorg articles about superconductivity. See also a recent Physorg article entitled "A stream of superfluid light," June 5, 2017. In my comment (tenth post overall) I show how that article validates posts I made in 2010 and 2012, both of which cited Art Winfree and what I call his "law" of coupled periodic oscillators. Winfree's law, which he proposed circa 1967, is well vetted mathematically, by people such as Steve Strogatz and Ian Stewart. Winfree applied his law successfully to biology, and others have followed in his footsteps. To the best of my knowledge, I am alone in proposing that Winfree's law applies broadly and usefully to physics. These two recent Physorg articles deal with superfluidity and superconductivity. Art Winfree's theory explains the perfect synchrony and coherence that these two phenomena exemplify. Planck's quantum of energy is an extremely precise periodic oscillation. Periodic oscillations are the "stuff" to which Winfree's law applies.